Monroe’s Hannah Hvitved is forced out at second base by Glacier Peak’s Emily Scott during the game Tuesday, April 2 at Glacier Peak Field. Glacier Peak defeated Monroe 22–1. Glacier Peak held Monroe to just one run in the first inning while scoring 22 runs for the victory. Glacier Peak sits in second place behind Lake Stevens in the Wesco 4A standings. Monroe was in fifth with a 2-2 conference record (7-3 overall) as of press time. Monroe was scheduled to play against fourth place Cascade on Monday after press time. Glacier Peak’s next upcoming game is a home game Thursday, April 11 against Mount Vernon. Tuesday’s game after press time was against No. 1 Lake Stevens. Glacier Peak midfielder Scott Burkholder (#23, junior) and forward Dylan Holmes (#19, senior) bracket Monroe midfielder Kevin Garnica (#20, senior) and forward Caden Kaasa (#14, freshman) in a line up of players reacting to a “throw in” ball during first half action at the game Wednesday, April 3 at Monroe High’s field. Both teams had a dog fight on their hands and the result was a 0 - 0 tie game with no goals scored. As of Sunday’s standings, Glacier Peak stood at 0-3-2 (1-4-2 overall). Monroe stood at 0-5-0 (1-6-0 overall). On Monday after press time, Glacier Peak played the Mariner Marauders and Monroe played Cascade. Glacier Peak plays Lake Stevens at home on Wednesday at 7 p.m. while Monroe has a home game against Mount Vernon on Wednesday at 7:30 p.m.
Everett Silvertip Martin Fasko-Rudas (7) is swept of his feet after chasing the puck to the corner with Spokane Chief Luke Toporowski (22) on his tail. Behind them is Everett Silvertip Gage Goncalves (39) waiting for a deflection in front of the Spokane goal. 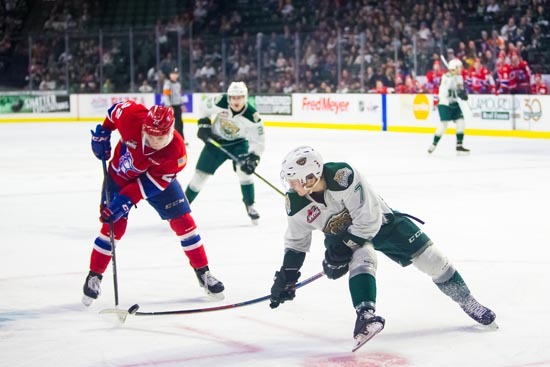 The Everett Silvertips played the Spokane Chiefs both Saturday and Sunday but wasn’t able to start the second series in the playoffs with a win. Everett lost Saturday 3-6 and narrowed the gap on Sunday with a 1-3 defeat. Spokane leads the series 2-0. The Everett Silvertips will travel to Spokane to play games three through five (if a game five is necessary) in a best of 7 series. Glacier Peak Grizzlies for a 6-4 win, and stay undefeated, in a game at Glacier Peak’s field on Friday, March 15. Junior Jordan Crawford, above, pitched a complete game, allowing seven hits and one error. Along with a 3-0 record to start this season, the Panthers also remain undefeated in their cross-valley rivalry with the Grizzlies, who are 1-2 to start this season. Glacier Peak’s Zach Rodriguez makes the catch as Snohomish Panther Michael Hill (No. 4) didn’t win the race to first base during the Snohomish Panthers’ loss to Glacier Peak 2-0 on March 12. The game was a pitchers’ duel until the fourth inning when Glacier Peak loaded the bases at one point and drove in two runs on errors by the Panthers. Wet March weather forced moving the game to Snohomish from Glacier Peak High at the last minute, and the game was played under patchy clouds. At Tacoma, the whole group of Snohomish and Glacier Peak girls players and coaches gathered for a group photo. In an exciting double overtime game, Glacier Peak defeated Chiawana 58 to 49 at the Hardwood Classic. Aaliyah Collins (22) led all scorers with 20 points for the Grizzlies, including a last-second shot to tie the game as time expired, causing the game to go into overtime. Haley Grambo scored only 4 points in the game which included a two point shot sending the game into a second overtime. The Grizzlies on Friday, March 1 then beat Woodinville 53-51 in a tight game and went on to place 4th in the tournament with a 58 to 53 win over Central Valley on Saturday, March 2. The Glacier Peak Grizzly boys got into the State tournament but were shown the door during the first round, courtesy of Curtis High School. Here, Glacier Peak’s Brayden Corwin (23) drives past Curtis’s Jordan Parker (4) during action Wednesday, Feb. 27 at the 4A Hardwood Classic in the Tacoma Dome. The game was a loser-out game. Glacier Peak was among the many teams the Curtis Vikings topped on its way to fifth place in the tournament. Glacier Peak put up one of the better fights, leaving just the three-point gap. This was the third consecutive year that the Grizzlies have made it to the State tournament and third consecutive year they were eliminated in the first game. The Snohomish Panthers had an up and down run at the State 3A Hardwood Classic Tournament in Tacoma. Following a 42-39 victory over Seattle Prep that went to overtime in round one, Snohomish couldn’t overcome Kamiakin High of Kennewick, losing 57-39 in round two on Wednesday, Feb. 27. The Panthers then won a consolation game 45-21 against Edmonds-Woodway on Friday, March 1. They also won 38-33 on Saturday against West Seattle. At left, Snohomish’s Maya DuChesne (14) drives to the hoop during the game against Kamiakin at the 3A Girls Hardwood Classic. DuChesne added nine points to the Panthers’ tally in this game. Dietiker, while Grizzly senior Fletcher Douglas (20) looks on during the first half of the Grizzlies’ 56-49 win in the 4A state regional game at Everett Community College on Friday, Feb. 22. The win moves the Grizzlies (15-7) into the State Hardwood Classic Tournament at the Tacoma Dome where they took on the Curtis Vikings (19-6) in an elimination game on Wednesday after press time. This is the third consecutive year that the Grizzlies have made it to the State tournament. They were eliminated in the first game each of the last two years. 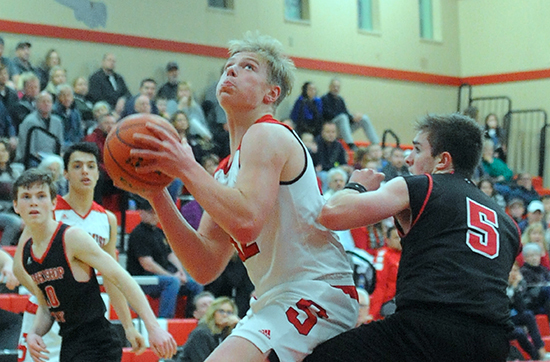 Trailing through the entire first-half of Saturday night’s 3A state regional game at Jackson High School in Mill Creek, the Snohomish Panthers mounted an 11-0 run to open the second-half to take the lead and hold on for a 38-35 win over the Lake Washington Kangaroos. Senior Maya DuChesne lead the Panthers with 16 points. The win advances the Panthers (16-7) to the State Hardwood Classic Tournament in Tacoma. They faced the Seattle Prep Panthers (19-5) in an elimination game on Wednesday after press time. Above senior Courtney Perry looks for the basket while being defended by Lake Washington’s Elise Hani. The Glacier Peak Grizzly girls traveled to Spokane last Saturday, where they lost 59-44 to the Central Valley Bears in their non-elimination 4A state regional game. The Grizzlies advanced into the State tournament in Tacoma this week, however with Saturday’s loss the Grizzlies failed to secure a bye from the elimination round games. The Grizzlies (20-3) faced the Chiawana Riverhawks (19-6) of Pasco on Wednesday after press time, with the loser heading home early. The Jackson Timberwolves boys were beaten by the Federal Way Eagles 69-49 in Puyallup on Saturday. The Timberwolves (18-5) headed into the Hardwood Classic where they played the Puyallup Vikings in an elimination round game on Wednesday after press time. The Mariner Marauder boys (14-10) briefly reached State tournament play, but got knocked out in a loser-out 4A state regional game to the Kentridge Chargers in Auburn 74-50 on Saturday. Monroe High’s Cole Lance (right, in orange) defeated Sumner’s Jonathan Williams in a 5-2 decision to place 7th at the Mat Classic XXXI 4A 126lb. weight class Saturday Feb. 16, 2019 at the Tacoma Dome. Arlington High’s Kristian Fairbanks defeated Snohomish High’s Ryan Cote (right, with "S" on jersey) in a 5-3 decision in the 3A 160lb. weight class. Cote moved to the consolidation bracket and defeated Drew House of Mt. Spokane in a 6-1 decision to place 7th at the Mat Classic XXXI, Saturday Feb. 16 at the Tacoma Dome. Glacier Peak Grizzly junior Brayden Quantrile (10) reaches for the basket while being defended by Mount Si Wildcats’ Jabe Mullins in the first-half of Saturday night’s Wes-King District tournament game at Jackson High School in Mill Creek. Having received a bye for the tournament’s first-round, the Grizzlies opened with a 55-31 win over Redmond on Friday. On Saturday, the Grizzlies took a lead over the state’s top ranked Wildcats going into half-time but could not keep the pace going as the game went into overtime with the Grizzlies losing 60-53. However, the Grizzlies still advance to the state regionals which begins this weekend. Snohomish freshman guard Ella Gallatin soars for two of her nine points in the Panthers’ 60-47 win in 3A District 1 over the Arlington Eagles on Saturday, Feb. 16 in the Everett Community College gym in Everett. Snohomish had strong shooting and a tough defense, holding the Eagles to two points in the first quarter and 12 in the first half. The Eagles drew many fouls which the Panthers converted to valuable points at the free throw line. The games scoring was led by Snohomish’s Courtney Perry with 17 and Maya DuChesne with 14. Eagle Keira Marsh had 13. The Panther girls are heading to the State tournament. After an extended delay in the basketball season due to the weather, the Wes-King District tournament resumed late last week. Having qualified for a first-round bye, the No. 1-seeded Glacier Peak Grizzlies opened tournament play with a 57-37 win over the Newport Knights of Bellevue on Thursday. The Grizzlies followed that up with a final second win over the Eastlake Wolves of Sammamish at Jackson High School on Saturday. Down by ten going into the final quarter, the Grizzlies used their aggressive defensive play to take a two-point lead with less than 20 seconds of play, then won the game 57-56 as Eastlake missed a free throw shot in the final second of the game. The win gave the Grizzlies a pass to the state tournament which starts this weekend. Left, Grizzly sophomore Maya Erling tries to drive between Eastlake’s Callie Lind (left) and Emily Holsan in first-half action. Glacier Peak Grizzly senior Noah Forman (center) is fouled as he tries to break through the defense of the Lake Stevens Vikings, including Viking junior Joe Gonzales (10) during play in the Grizzlies’ 62-36 win at Glacier Peak on Wednesday, Jan. 23. In second place at 12-5 (10-1 league) and averaging 60.4 points per game at the start of this week, the Grizzlies still had a slim chance for the league title as they hosted the Jackson Timberwolves (14-3, 11-0 league) on Wednesday, Jan. 30. The Grizzlies’ lone league loss up to this week was to the first-place Timberwolves, 63-59, on Jan. 4. The Grizzlies conclude the regular season with a home-game matchup with the Mariner Marauders (10-7, 6-5 league) next Tuesday, Feb. 5. Jackson senior Lauren Schillberg (#22) wrestles with Monroe’s Brynna Schmidt (#2) and Skyler Witham (#10) for control of the ball during action at Monroe High School on Friday, Jan. 23. The Timberwolves won 58-44, never letting the Bearcats get much of a lead. Jackson’s Olivia Skibel led the Timberwolves with 13 points. Schillberg, a senior at Jackson, added 10 points of her own. Monroe’s Sydnee Gendron led the Bearcats with 10 points. In Wesco 4A, Jackson improved to 13 – 4 overall and the Bearcats fell to 6-11. As the prep winter sports regular season begins to wrap up, the post-season line-up for basketball is beginning to unfold. At Snohomish High School, the Panther girls opened this week in a three-way tie for the Wesco 3A’s top spot. Tied with the Archbishop Murphy Wildcats and the Arlington Eagles, while the Shorecrest Scots are just one-game behind the top three. The Wildcats are a 2A level team and will not factor into the District 3A tournament. The Panthers have two games scheduled this week, both on the road. That includes a meeting with the Eagles in Arlington on Friday that could determine which team gains the league title. The Panthers’ final regular-season home game is this coming Monday, Feb. 4 against the Everett Seagulls. The Panthers were 11-6, 10-1 league entering this week with senior Maya DuChesne leading the team with a 13.9-points per game average. Senior Courtney Perry follows with 11.1-points per game. The Panther boys have struggled all season. At 5-12, 2-9 league, the Panthers tied with the Everett Seagulls in the Wesco 3A cellar. Although the team is at the bottom, senior Kolton Smith’s 21.1-point average per game puts him third on the Wesco 3A leader board. At Glacier Peak, the Grizzly girls are soaring high with a 16-1 (11-0 league) record at the start of this week and are in the lone position at the top of the Wesco 4A. Averaging 60.4 points per game, the Grizzlies also lead the Wesco 4A. In fact the team has outscored opponents 1,027 to 596 entering this week. The Wesco-Kingco bi-district tournament begins on Feb. 7, with the top two seeds receiving a first round bye and avoiding a loser-out matchup. 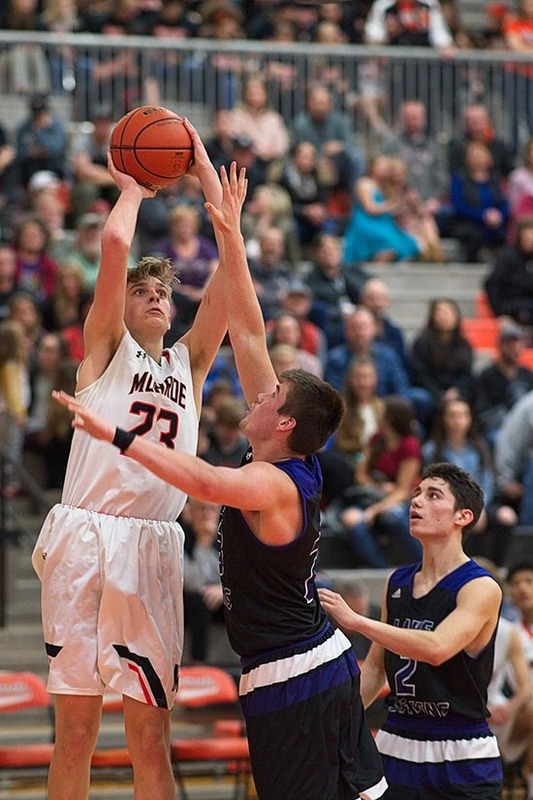 The Monroe Bearcats boys are 4-13 (3-8 league) going into this week. They lost four-straight games prior to this week including a 65-48 loss to first-place Jackson last Friday. Junior Efton Chism III leads the Bearcats with 16.2 points per-game which puts him into the top five of scorers in the Wesco 4A. After eight-straight losses, the Everett Seagull boy’s were able to come out with a win by beating Oak Harbor 53-45 last Friday. At 3-14 (2-9 league), the Gulls are hard pressed to see post-season action this year. The Seagull girls could also miss out on the post-season as they were in eighth-place going into the week with a record of 8-9 (3-8 league). The gulls won two of their last five at the week’s start. UP AND OVER: Snohomish Panther senior Maya DuChesne sank a game-high 16 points while senior Courtney Perry and freshman Ella Gallatin had 11 points each as the Panthers won their seventh straight game beating the visiting Stanwood Spartans 55-38 on Thursday, Jan. 17 in Snohomish. The win kept the Panthers (10-6, 9-1 league) in the lead of the Wesco 3A by one game over Shorecrest, Archbishop Murphy and Arlington. With two weeks left in the regular season, the Panthers would need to keep the streak alive to clamp down a first-round bye in the Wesco 3A district tournament. At left, DuChesne (right) reaches over her shoulder and flips the ball behind her to sink a basket while being defended by the Spartans’ Taylor Murphy late in the first-half. be short of qualifying for district play. Glacier Peak Grizzly sophomore Aaliyah Collins (right) drives around Monroe Bearcat junior Hannah Hvitved (center) while GP sophomore Madison Rubino (center) and Monroe senior Brynna Schmidt (left) watch from behind during the first half of the Grizzlies’ 66-17 win in the Grizzly gym on Friday, Jan. 18. With a record of 14-1, 9-0 league, the Grizzlies are on the top of the Wesco 4A standings while holding a one-game lead over the Lake Stevens Vikings. The Grizzlies beat the Vikings 68-50 earlier in the season. The two teams faced off on Tuesday of this week in Lake Stevens after publication time. The Wesco 4A has two and a half weeks remaining in its regular season. Snohomish Panther sophomore Grady Kentch (center) looks to the basket as he is guarded by Arch-bishop Murphy Wildcat senior Colin Guy (right) during action in the Panthers 55-41 win over the Wildcats in Snohomish on Monday, Jan. 7. The win broke a six-game losing streak for the Panthers (2-6, 5-8 overall) and was their first league win of the season. The Panther girls (7-1, 8-6 overall) have won five straight, including three last week as they sit at the top of the Wesco 3A along with Arlington and Shorecrest going into this week. In Glacier Peak prep basketball news: The Glacier Peak Grizzly boys won 71-50 against Mariner on Wednesday, Jan. 9 and won a home game 71-45 against Mount Vernon on Friday. The Grizzly girls won their two games last week by healthy margins: Glacier Peak won 59-12 against Mariner on Tuesday, Jan. 8 and won 79-39 against Mount Vernon on Thursday, Jan. 10. The Grizzly boys (6-1 league, 8-5 overall) stand second in the Wesco 4A behind Jackson, which is 7-0 in league play. The Grizzly girls (7-0 league, 12-1 overall) stand in first place at press time. 10 points. Lake Stevens’ Jacob Ramires scored 17 points and Joe Gonzales scored 13. The Bearcats (3-4 league, 4-9 overall) are in sixth place in Wesco 4A; Lake Stevens (1–6 league, 6–8 overall) is seventh. 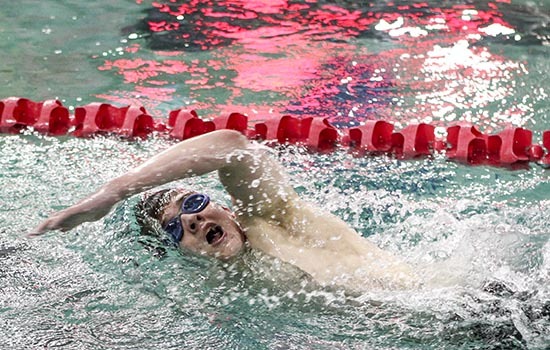 Peak, Marysville-Pilchuck, and Marysville-Getchell High School Swim and Dive meet hosted by Snohomish High on Tuesday, Jan. 8 in Snohomish. In team competition, Snohomish went on to defeat Marysville Pilchuck 125 - 56 and Getchell 133 - 39. Glacier Peak defeated Marysville-Pilchuck 131 - 56 and Marysville-Getchell 138 - 39.